The teacher’s aide suspended from her job has definitely put the concept of “background checks” under the microscope today. The BCLUW school district in Conrad, Iowa got an anonymous tip that a woman going by the name of Paula Pace was actually Paula Baniszewski, a woman convicted of manslaughter for her involvement in a gruesome child murder back in 1965. Do you ever stop to think about the people working at the businesses you frequent, the school where your kid matriculates and wonder: did they go through a background check? You will now, won’t you? Paula Pace or Baniszewski, or whatever you want to call her, had been working at the district for 14 years when the anonymous tip came in. She’s now been suspended from the job. But the truly scary thing is, the murder Baniszewski was involved in was rather big news back in the day, and details are plastered all over the Internet. Even 14 years ago, we had the Internet, people. And this case is pretty well documented. Apparently Paula was 17 at the time and living with her mother, Gertrude, and several siblings. 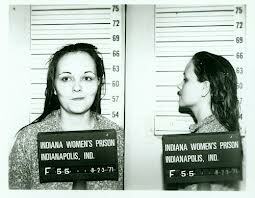 Gertrude, who was nicknamed the “Torture Mother,” had also taken in two young teenagers, Jenny and Sylvia Likens. It was Sylvia Likens’ murder that would send Gertrude to jail for nearly 20 years. Internet accounts of the murder are pretty gruesome. They say not only were Gertrude and Paula involved, but so were other kids in the family and other kids in the neighborhood. Sixteen-year-old Sylvia suffered everything from cigarette burns and having her chest tattooed with the word “prostitute” to being tied to a bed and being starved and beaten. Paula was sent to prison, from which she escaped, adding to her time. She eventually got out in the mid-1970s. One Internet account refers to rumors that she had changed her name and was living on a farm in Iowa. Apparently they weren’t that far off. But if that was readily available on the Internet, how was a school district caught off guard? How was a woman convicted of such a heinous crime allowed to spend her days working with children? I worry about the kids in that school. I also worry how many other places of employment are doing such an awful job of poking around in the past before they’re handing out jobs? If such a brutal, brutal crime can be simply forgotten, what else are people moving past while they walk among us, swiping our credit card at the local grocery store or pushing our kids on the swings? Do you think it’s right that Paula Pace/Baniszewski served her time and deserves to move on or is this something that should have barred her from this job?